Data visualization tools are a broad range of analytical aids that help you take your data from incomprehensible chaos to epiphany-inducing designs that can easily be presented and shared. In the business world, data visualization tools allow you to see patterns and trends in information that would have otherwise been buried under the sheer weight of the data you have at your disposal — but their job doesn’t end there. These tools also provide you with the opportunity to present your data to other people so as to educate them about, or persuade them of, specific phenomena. In short, data visualization tools help you — and others — see the picture clearly. 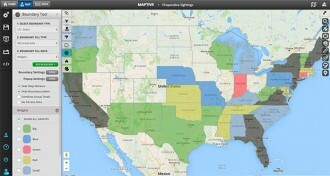 Maptive prides itself on creating the best data visualization tools out there, and you want to know how we do it? Okay, you caught us. It’s in our name. Map Data Visualization Is Our Speciality. We love the alchemy of punching in raw data and Voila! Out pops clarity, insight and structure in the form of a magnificent masterpiece of a meaning-making map. Like the first astronomers who drew lines between the stars to form constellations that organized the night sky, Maptive takes the great unknown and forms a visual narrative that we can all share in. Business professionals use all sorts of methods to track their progress, identify opportunities and make their organizations run smoothly. In most companies, data visualization tools of some sort are an integral part of these tasks. The point is to take complicated information and make it digestible. Think of the best data visualization tools as the upper part of digestion tract — the teeth, the mouth, the saliva, the tongue. Without these parts, you would have to swallow your food whole. Attempting to swallow data whole will leave you and your company feeling very ill. There are various types of data visualization tools, and mapmaking is by no means the only method out there. We have found, however, that when it comes to numerical data that is in some way linked to spatial and geographical factors, mapping is an unparalleled way to firstly understand what your message is, and secondly to get it across. To let you in on the origins of the human impulse to reconfigure data at all, let’s return to middle school and the humble hand-drawn mind map. Regardless of the school you attended, there must have been some point when you took scads of text and transformed it into a digestible picture that helped you understand the material. While the best data visualization software is a far cry from the Grade 6 mind map, the impulse is the same — to re-envision information in a way that helps you form patterns so as to comprehend and make sense of what is being presented to you. Nowadays, interactive data visualization technology comes in all shapes and sizes. Like Maptive, many options are cloud-based, meaning they have robust capability, do not need to be downloaded or installed, and can be accessed from any connected device at any time. Some products help you envision your information as charts and graphs, others help you quickly create infographics and reports, while still others focus on the aesthetics of creating eye-catching presentations. Data visualization tools have become particularly useful in the world of digital marketing, where the reams of data that we now have access to about our potential and current customers can be easily transmuted into visual summaries that let you draw the dots. Map data visualization has become an integral part of this burgeoning industry, not just in the field of digital marketing, but across the whole business landscape. So much of your company’s data is location based in some form — whether it pertains to the sales performance of your employees, opportunity gaps that need to be filled or trends in the behavioral patterns of your customers in particular areas. Our map data visualization software provides a clear path through the clutter of data sets big and small. The best part — we make it look so good. When it comes time to present your map to anyone you need to impress, our maps will make you feel like you have a whole army behind you. We don’t want to get you too excited, but have a look at this map created using our heat map tool, which we will tell more about in a moment. 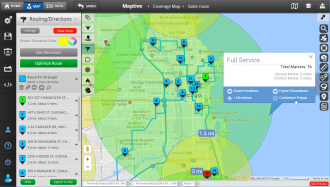 At Maptive, we specialize in envisioning your location based data in a way that makes sense to you. Our greatest source of pride is how customizable our maps are, meaning you can use our data visualization tools to mold your information into a picture that makes sense to you. Whether that means changing the color of specific regions to highlight an emerging trend or turning your markers into cat heads and calling them “meowkers,” we want our data visualization tools to feel like yours. Our maps are created from interactive data visualization tools, meaning they cater for bi-directional communication. This isn’t the 2D map used by explorers of old. Our maps want your input. The ability to zoom in and out so that you get the exact picture you are looking for. The capability to gain in-depth insights into your data sets through our suite of tools. Love at first sight? We know. It’s like finding your soulmap. Now that you’ve been introduced to our map data visualization tools, you’re probably itching to know how to use them. Luckily for you, you do not need an advanced degree in digital cartography to get going. In fact our tools are so easy to use, that even if you are the type to wander around parking lots looking for the car you parked just thirty minutes ago, you will find the learning curve kind. Maptive is powered by that company that brought you the best data visualization software out there when it comes to geographical and spatial data. That’s right — we are happily intertwined with Google Maps. You know, the product that has almost managed to create a detailed map of the whole world. Our integration with Google Maps means that all of the navigational features of the platform you’ve come to rely on as a matter of survival are available to you on our platform. Once you’ve understood your data using our data visualization tools, you can easily use your map in the same way you’re already accustomed to. Not to mention that because our data visualization tools are bolstered by the enterprise level capabilities of Google Maps, you do not have to worry about spotty coverage or unreliable service. We’ve got you covered. Right. You’ve got your reams of data and you’re looking to make use of our data visualization tools to map it. Where do you start? Our map data visualization software has two views, namely DATA and MAP screens. In the data view, you can input or import your data into our spreadsheet on our platform. The data visualization tools then get to work, and within a matter of moments, you have a beautiful map to look at. Now for the fun part. Let’s have a look at the best data visualization tools in our toolbox. We have a range of interactive data tools in our suite that work together to offer you new insights into your data. Want to meet our favorites? We thought you might. The heat map data visualization tool identifies points of density on your map according to the location data you input. From the criteria that you provide, the heat map tool quickly constructs a graphic representation that will give you immediate insight into the regions where your data is more heavily weighted. Through this window, you are able to see the degree and size of particular areas of density. You are instantly given insight into points of congestion and how far they extend. On the flip side, you are able to discern points of openness that are at this point lacking in substantive data. 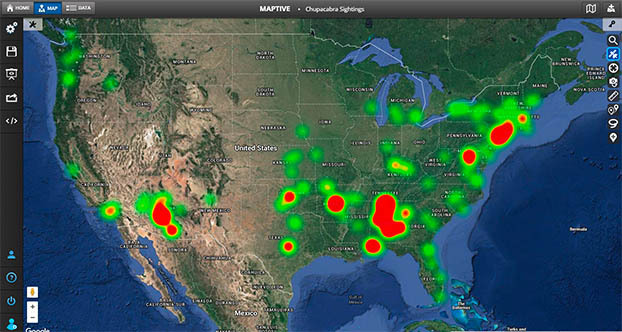 The heat map is one of the best data visualization tools for businesses. Using this tool is like putting on magic glasses that will let you quickly identify opportunities and areas of saturation. By grouping your data according to the criteria that you would most like insight into, you will be able to get answers to your most pressing questions within a matter moments. Seriously. It’s the oracle of data visualization tools. 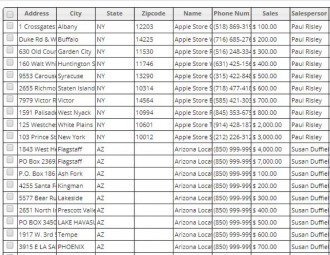 If you’re looking to see whether it would be a good idea to open up a new branch of your company in a particular area, or whether a specific city really needs a new donut shop, this is one of the best data visualization tools you can use. Within an instant, you can work out the viability of a proposal. Rather than spending hours hashing out the pros and cons of a decision you have to make, turn directly to your heat map and let it give you the insights you need. Would you like to know what areas your product does the best in, or where the locals simply do not care for the services you offer? Perhaps you would like to figure out which of your area salespeople are able to land the greatest conversions. Provided your data is numerical, a heat map is a highly effective data visualization tool to do this. Easily combine your heat map with other map data visualization tools to get more complex analyses of your data. The boundary tool, for example, that allows you to demarcate specific areas on your map according to chosen criteria, is an excellent bedfellow to the heat map data visualization tool. Our heat map data visualization tool is fully customizable, allowing you to adjust the opacity, radius, intensity threshold, as well as the gradient colors that are displayed on the map. You get to decide how high you want the heat turned up on your map. Creating a heat map is as simple as turning on the heat in your house. All you have to do is go to our MAP view, select the Heat Map tool, and you’re ready to go. Then the fun part starts. You get to make your map uniquely yours. Why not try the heat map data visualization tool right now? Because you can. Simply click on the following link, and we’ll let you try it for free. If setting boundaries is a problem in your life, perhaps you should try out one of the pride-and-joys of our data visualization software — the boundary tool. The boundary tool allows you to demarcate boundaries on your map so as to aggregate your numerical data according to the area types you have selected. This map data visualization tool allows you to draw regional boundaries according to categories such as world countries, states, counties, cities or congressional districts, and then find out more about what lies in the depths of those regions. The uses of the boundary tool extend beyond creating simple regional demarcations. It allows you to aggregate the data you have inputted according to the markers that exist in a particular region. You can then select a particular color according to the prevalence of a chosen factor. Perhaps you want to pick the color green for all regions that have a high sales data, or pink for the areas that have a high bracket median income. Within moments, you will quickly know where to focus your efforts. Let’s take the example of a company that, while currently fictional, should not remain so forever. It’s called Rocking Rocking Chairs and caters to the elderly population who are looking for a musical accompaniment to their daily sit. Rocking Rocking Chairs uses this map data visualization tool to decipher that their greatest sales are made in regions near bodies of water. They decide that there is room to open up new branches in these areas for retirees who are looking for a little music to go with their water view. If you, like Rocking Rocking Chairs, would like to hear the music in your data, why don’t you try our Boundary Tool on the house right now? You know what else Rocking Rocking Chairs could benefit from? A tool that gives them quick insight into demographic data. Guess what? Such a tool exists and is integrated with the boundary tool. The demographic mapping tool is one of the most useful data visualization tools if you are looking to quickly understand population statistics without putting in the slog work to do so. This tool allows you to instantly transforms census data into something you can visualize on your map. Open your boundary tool in your map. Configure your boundaries according to geographic data type type, eg. by state, county or city. If you’re looking to find out where all the double income families with two children are living, now you know. 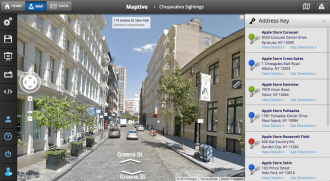 Maptive is data visualization on Google Maps at its most useful — a portal into location based insights that will allow you to hear the music rather than the noise. We offer a free trial that comes to you at no risk. No risk means we don’t even take your credit card details. Our data visualization tools will be a huge asset to your company. But don’t take our word for it. Why don’t you play around and create your very own heat map, or have fun with our boundary tool? You’ll quickly see why we are among the best data visualization software options out there.